Although the cycling season has no official start, most casual cyclists start thinking about dusting off their bike after it has spent the winter in hibernation and taking it for a ride around this time of the year. And because it’s only appropriate to start the new season with a new bike accessory, we bring you a list of 5 best cheap but genuinely useful bike gadgets. Every cyclist needs a good multitool. Some prefer larger multitools with lots of bells and whistles, while others go with more minimalist multitools with only the most essential tools. If you count yourself among cycling minimalists, the Reductivist Ringtool might just be the perfect multitool for you. Designed and manufactured in the United States out of nickel-plated steel, this incredibly useful and lightweight keychain accessory has everything you need to do most common bicycle repairs and adjustments, including changing the saddle height, adjusting the rear and front derailleur, or aligning the brake pads. The Ringtool features a regular screwdriver, flathead screwdriver, Allen wrenches from 4 to 10 mm, and T25 TORX screwdriver. It also has a handy bottle opener in the middle, so you can celebrate your first ride of the season in style. Get it here. If you love your bike, you should try your best to protect it from getting stolen. Of course, a couple of heavy-duty bike locks is a good first line of defense, but bike thieves are a resourceful and shameless bunch, not afraid to pull out bolt cutters in broad daylight and pretend to be “rescuing” their own bike.What you need is a way how to draw attention to the thief to scare them away. The Wsdcam bike alarm with a remote controller is up to 113 dB loud, which is approximately the loudness of a police siren. The alarm activates automatically whenever it senses that someone is moving with the bike to which it is attached, but it can also be activated manually from a distance to make your bike easier to find. You can choose between 7 different tones, each of which corresponds to a certain level of loudness. Get it here. Forget dedicated bike computers. With mobile apps such as Bike Computer and Strava, your smartphone is the best bike computer there is. The problem is that smartphones don’t come with a bike mount, which is why you need this excellent universal and fully adjustable bike phone mount for smartphones that are between 3.5 and 6.5 inches wide. The bike phone mount installs easily and without any tools to any handlebars, and it features a very secure locking mechanism that is going to keep your smartphone locked in place even on the bumpiest terrain. Get it here. Situational awareness is a key to safe cycling. The problem is that bikes typically don’t come with rearview mirrors, with the exception of touring bikes, because they significantly increase the bike’s width, making it less maneuverable in traffic—not to mention that traditional rearview mirrors are far from fashionable. This rearview mirror from JOOKKI is different than traditional rearview cycling mirrors because it doesn’t mount on the handlebars. Instead, you wear it on your wrist like a wristband. It turns out that the wrist is a great place for a rearview cycling mirror for a number of reasons. Compared to handlebar-mounted rearview mirrors, this wrist-mounted rearview mirror from JOOKKI is a lot more inconspicuous, yet it makes it very easy to see what’s going on behind. And compared to helmet-mounted rearview mirrors, the JOOKKI mirror is a lot more stable thanks to its anti-vibration design. Get it here. Signaling the direction you intend to turn on a bike is easy, right? Well, sort of. Sometimes the road surface is far too uneven to safely ride with just one hand on the handlebars, which is where a bike turn signal light such as this one from CHFUN comes in. Instead of having to extend your arm every time you want to make a turn, you can just slightly lean your bike in the direction you would like to turn, and the light will automatically display the appropriate direction arrow. 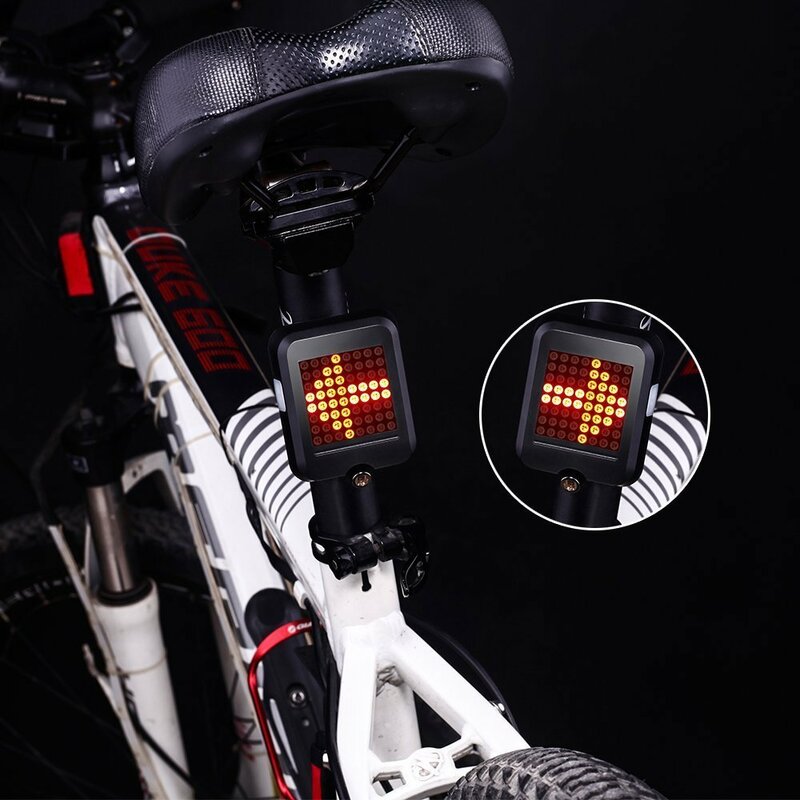 The CHFUN Bike Turn Signal Light has a built-in rechargeable battery that lasts up to 6 hours and can be charged back to its original capacity in about 3.5 hours via a USB port. Get it here.